Mark Krieger: Cycling In Slovenia: Rateče to Kamniška Bistrica (115 kms). Cycling In Slovenia: Rateče to Kamniška Bistrica (115 kms). Today’s ride, from Rateče to Kamniška Bistrica, was as leisurely a beginning to a long journey as you could wish for. The first 30 kilometres along the tranquil valley floor was sprinkled with tiny villages. Slightly downhill, following the Sava Dolinka, it was an effortless ride, while even the cars seemed to move by unnoticed. Running parallel with the road was the D2, one of the myriad of cycle paths throughout the country. If only the Victorian state government back home, promised to incorporate more cycle paths within its road infrastructure. One can only hope that it might even capture the imagination of the electorate. Then again, Victoria’s motorists seem to have a lot less patience for its fellow road users than do their European counterparts. 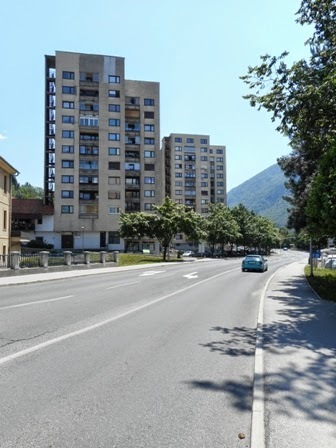 Still relatively easy on the eye, I experienced my first taste of suburbia at the town of Jesenice, once the home of mining and iron making industries. However, following the breakup of Yugoslavia, economic change led to less ironwork production, causing massive layoffs of employees and emigration of people in search of new employment. In more recent times, the town has sought to become less dependent on its metallurgic industry, developing other economic strings to its bow. Unlike most European towns, there were few red lights in Jesenice to impede my progress. The loss of continuous motion through traffic-laden towns, and even worse, cities, can be the constant bane to the cyclist who’s just passing through. Barely 15 kilometres to the south, from Jesenice, is Lake Bled. The vista includes a medieval castle literally clutching the side of a cliff and a Baroque church-with its 99 stone steps leading up to the entrance-exquisitely ensconced on an island surrounded by trees. 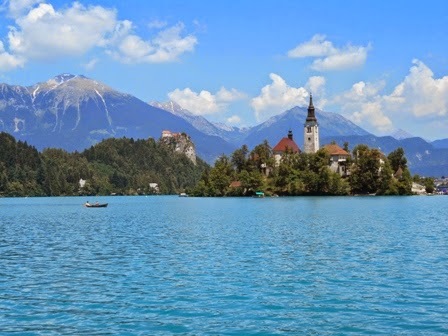 Add to this a glacial lake and a towering mountain backdrop and you have Slovenia’s most popular tourist attraction. Soon the road I was on veered left towards Zirovnica, and beyond here the mountains, while to my right snaked the motorway from Austria. With almost 8000 metres of tunnel behind it, this less than busy stretch of highway was heading towards the Slovenian capital of Ljubljana. Once you leave the valley floor there is only way you can go: up! The road towards Tržič was my first serious climb for the day, though not as steep, nor as long as I expected it to be; nevertheless, steep enough to provide me with a swift and smooth descent into town. Despite a map and the supposedly easy-to-follow road signs, I’ve come to expect the expected; that is, somewhere along the way I’ll become lost. Presumably on the outskirts of Kranj, a rather bustling and fast-moving town – at the very least by road - I approached a pair of cyclists for help. A young couple - I think somewhere in their 20’s - they appeared to be very fit, as testified by the 70 kilometres they had just ridden themselves. Following a lengthy conversation about each others’ comings and goings, they kindly had me follow them to a small village, Kokrica, from where I could again continue my journey along both road and map. 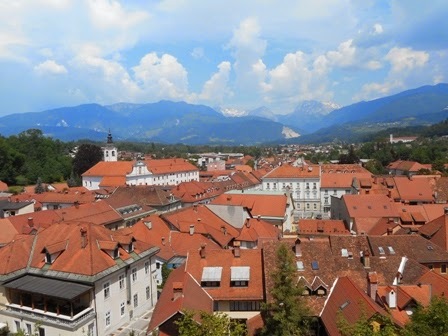 The view of the Kamniška Savinjske Alps from Kamnik. Once more I was gliding from village to village, with a clear road seemingly ahead. That was until I reached Cerklje na Gorenjskem. Not easy to say and even more difficult to get out of, I again had to enlist the help of an unsuspecting local. This time it was a young lady, who in her own words spoke “Just a leetle English”. Faster than a telephone exchange employee, she put her mouth to her mobile and within seconds a rather hefty young led came bounding along the footpath. Most likely her son, his impeccable English soon had me on the exact road I needed. Following a very steep climb towards Apno, made all the more difficult by the lingering heat, I eventually reached the medieval town of Kamnik, where the route finally became much easier to follow. From here it was just another 10 kilometres to our accommodation at House Berdnik, in Kamniška Bistrica. The road, which gradually travels uphill towards the snow capped peaks of the Kamniška Savinjske Alps, is a popular destination for local cyclists, as testified by the numbers I passed travelling each way. While the road is eventually encased by a semi-circle of mountains, many walks continue further up ont its steep slopes above. That evening, now entrenched in the mountains, we gorged ourselves on a magnificently procured meal of local trout, grilled cheese and vegetables, salad and bread. Slovenian hospitality continued back at our accommodation, when our very affable host, Frank, offered us his home-made limoncello. Needless to say, it was an evening to remember! “Give a man a fish and feed him for a day. Teach a man to fish and feed him for a lifetime. Teach a man to cycle and he will realise fishing is stupid and boring”.